If you read The Bismarck Tribune on Tuesday morning, you read Amy Dalrymple’s pretty good story about Monday’s marathon Little Missouri Scenic River Commission meeting. I’m going to write more about that later. I’ll just say, for now, be careful what you wish for. What I want to write about today is one of the things the commission discussed Monday — the illegal bridge over the Little Missouri State Scenic River on the Wylie Bice Ranch in Dunn County. I’ve written about this a few times, but there are new developments and I’m going to address it one more time — for now. Wylie Bice is the uber-rich rancher from west of Killdeer, N.D., the man who built a trucking company from scratch and sold it for at least $79.9 million. Higher numbers have been bandied about, but we know from business journal reports he got at least that much. He’s a real North Dakota success story. Good for him. 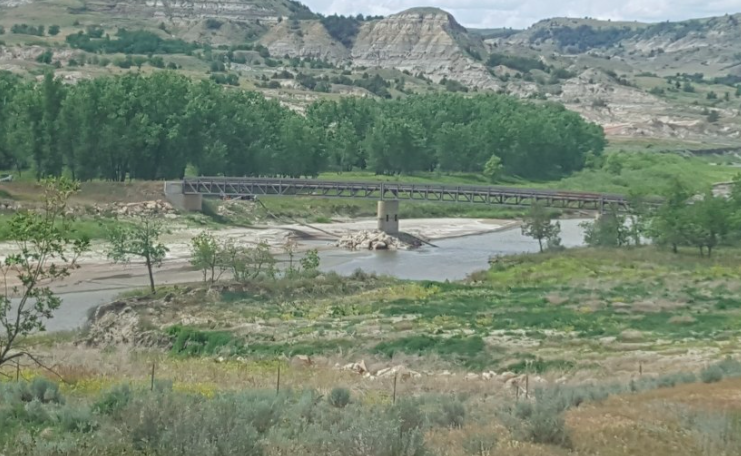 He may have had some debt to pay off with the proceeds, but he had enough left over to buy a neighbor’s ranch, giving him land on both sides of the Little Missouri State Scenic River. He needed to get back and forth, so he built a bridge — a mighty expensive bridge, probably a couple of million dollars worth — and put one end of it on land he didn’t own. It took a few years for the owners — the U.S. government’s Bureau of Land Management — to find out about it, and when it did, it did what government agencies do: It set out to do a study to determine what to do about Bice’s transgressions. That study starts next week, at the end of a public comment period. What the BLM has done is required Bice to submit an application to build a bridge on their land (a bridge that already exists). He’s done that. Now they’re requiring an Environmental Assessment, which Mr. Bice will have to pay for. The Environmental Assessment could be done yet this fall. It will lay out a series of alternatives, which could include tearing down the bridge, granting an easement and leaving the bridge in place or a new option that surfaced this week — just selling the land the bridge is on to Bice. It’s only about 80 acres, and it’s isolated from other BLM land holdings in Dunn County, and it’s certainly worth less than $79.9 million, so Mr. Bice can afford it. But it’s looking more and more like Bice is not the kind of man you want to do business with. For one thing, he’s a liar. Although he didn’t contact the BLM about putting a bridge on its land, he certainly knew it wasn’t his land. You see, Bice (or his engineer) did one thing right: they applied for a permit from the U.S. Army Corps of Engineers to put a bridge over the river, for which the Corps has management responsibilities. The Corps is only responsible for the river itself, though, not the riverbank. Bice owned the land on one side of the river and the BLM the other. In his application to the corps, Bice put in photocopies of two maps of the area. Both clearly show the land on the west side of the river is owned by the federal government. He even drew in the bridge on both maps, from his land onto BLM land. Here’s his map, from the Dunn County Atlas, with his note on the bottom showing the location of his bridge. There’s a second map in the application, from the U. S. Forest Service’s National Grasslands map, but I won’t bother you with it. So it is pretty obvious he knew he was putting a bridge where he shouldn’t be putting a bridge, at least without permission from the people who owned the land. Still, the excuse he used for building the bridge where it shouldn’t be, when questioned by the Tribune reporter, was that he thought he owned it. In other words, Bice, you probably should go knock on the BLM manager’s door and ask him if it is OK to put a bridge on his land. I did follow up with a phone call to the Corps lady, just to confirm. She said it was the responsibility of the person doing the project to contact the BLM. She said they assumed he had done that — it would only make sense to get permission before building the bridge. So if you read the Tribune story, and Bice’s statement that he thought he owned the land, and thought to yourself, “Well, anybody can make a mistake,” well WRONG. He knew exactly what he was doing. So now, I expect Bice to make a nice generous offer to the BLM for the land and hope it will accept it and just go away. I suppose that’s the most logical solution. But I hope that’s not what happens. That’s just not right. Just because you have A LOT of money, you shouldn’t be able to get away with something like this. It just leaves a bad taste. My suggestion is a hefty fine (although that won’t bother him, either), grant him an easement for the bridge and the road to it, charge him back rent for the easement and rent going forward and make him clean up the area around the bridge, get rid of his water depot, and reclaim the grassland where he planted alfalfa. This IS public land, land we all own. 1. Take no action (leave the bridge, road, pond and alfalfa fields on the land as is). This would not achieve the project purpose, but the BLM will analyze the effects to serve as a baseline. 2. Remove the bridge, road, pond and alfalfa fields and rehabilitate the public land to a condition similar to that of the surrounding public land. 3. Sell or exchange the affected public land to the adjacent landowner. 4. Authorize the bridge, road and pond through rights-of-way, and the alfalfa fields through a lease. 5. Authorize only the bridge and access road through a right-of-way, remove the pond and alfalfa fields and rehabilitate the public land. In the event a right-of-way for the bridge and road are granted by the BLM, the site would still remain inaccessible to the public, via road, due to the lack of public roads to the site. I actually really prefer No. 2, tearing the damn thing down, but it probably just doesn’t make sense to do that now that it is there. I wouldn’t mind if a lot of people suggested that, though. Other actions that would meet the purpose of resolving the issue. Suggested changes to the alternatives. Other concerns over project impacts. Data/information the BLM should consider in making a reasoned decision. People or groups the BLM should contact about this project. Future actions by BLM or others that could have a cumulative effect together with the proposed action. So if you want to commentand make some suggestions, go to this website. Down in the bottom right-hand corner of the page is a place to comment. I’m sending them this blog as my comments. We’ll get another chance to comment on the Environmental Assessment later. I’ll let you know when that time comes. Oh, and if you want a really good look at the site on an illustrated Google Earth photo, go here. These government guys have some cool tools. Mr. Fuglie — Thank you so much for your indefatigable coverage and advocacy on this, and other, issues. This posting has encouraged me to write a letter to the BLM. Great, Amy. The comment page is a bit cumbersome. You have to look hard for the “next” button way down t the bottom of your screen. Thanks, Jim, for your diligence in keeping track of things like this for the rest of us. In my opinion, Bice should NOT be rewarded for applying the adage that it’s sometimes easier to get forgiveness than permission. He took a gamble and has been found out. Perhaps a good solution would be for the BLM to try to find personnel unfamiliar with this story and have them review a land-use petition “ab initio,” without knowledge that the bridge has already been built. Then let the chips fall where they fall, and if they decide to sell him the land or provide an easement, problem solved. If not, then so be it–the bridge must come down. Gamblers should be as prepared to lose as to win.